It’s been a strange winter this year. Mild and wet for the most part with a with a few bright, crisp, days in-between the drear. Sitting by the fire has kept us feeling warm and nourished and I have become convinced that gazing at a wood fire is one of the best ways to avoid seasonal depression or the winter blues. Bringing evergreens into the house can have a similarly uplifting effect and is a midwinter tradition that stretches back into our deep pre-Christian past and is common to nearly all Northern European cultures. Conifers, Mistletoe, Holly and Ivy have been considered symbols of eternal life and immortality due to the fact that they stay green and lush amidst the barren winter landscape. In folklore it was believed that they offered a place for the faeries to dwell when it was too cold to be out of doors. They certainly offer shelter to birds outside of the house during the winter months as well as a valuable source of food. The berries of holly, ivy and mistletoe are toxic to humans and should be avoided but the leaves have been used medicinally for many centuries. The fresh young leaves of ivy were harvested and used to treat congested lungs, catarrh and coughs. Modern research has validated these traditional uses showing the ivy is anti-spasmodic and rich in saponins, soap like constituents which help to thin and remove stuck mucus in the body. They also help to reduce swelling in the respiratory tract. Some people are allergic to ivy so care must be taken, though reactions are rare. Holly was also used for coughs as well as for colds and flus. A few leaves were drunk in hot water as a general seasonal tonic and it was also considered cleansing, being used for arthritis and fluid retention as a diuretic. It’s astringent properties help to tone the mucus membranes and balance mucus production. Aside from its important purpose in facilitating kisses, it is also a valuable herbal medicine for treating a number of conditions. The leaves and twigs are the parts used and are most commonly made into a tea or tincture. The berries are fairly toxic but have been used externally in treating frostbite. 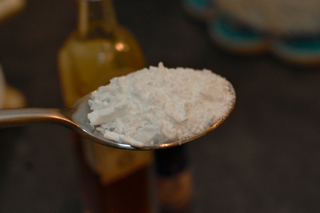 It used to be used as a specific for epilepsy but today it is most popular for treating high blood pressure. It is useful for balancing menstrual flow and can be an important remedy during the menopause for anxiety, heart palpitations and flooding. Some people can find it quite heating though so beware if you are already a hot person and it is also one to avoid in pregnancy. Mistletoe is also popular as a complementary cancer treatment, especially in Germany and Switzerland. These honey mushrooms, Armillaria mellea, are past their best now but in their prime they are both edible and medicinal. They have a history of use to treat neurological conditions such as vertigo and neurasthenia. Modern research has shown them to have anti-convulsive effects. Like all medicinal mushrooms they are also rich in polysaccharides and help to support proper functioning of the immune system. Similarly named but visually very different is the honey waxcap mushroom, above. The waxcaps have the most beautiful gills, as seen below with the equally beautiful butter waxcap. Winter beauty for me is all about the underlying forms and patterns of things. Whether that is branches stark against the sky, leaf veins illuminated by the low sun or the juxtaposition of hard edged rock and velvet moss. Next weekend is the RSPB’s Big Garden Birdwatch so don’t forget to stock up your feeders and spend an hour jotting down any feathered visitors you spot. 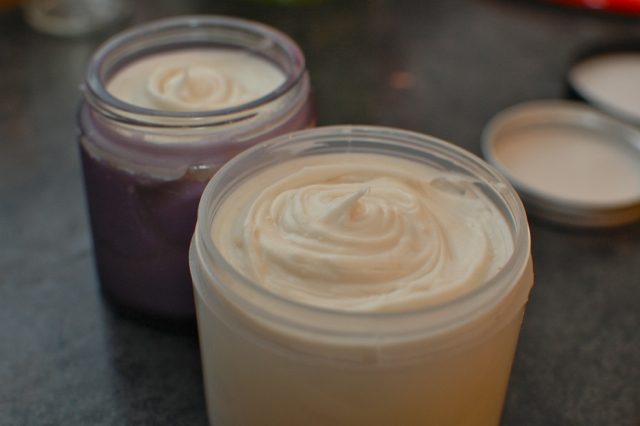 Cold weather usually results in dry skin so I have been making this lovely whipped body butter recipe recently. As I wanted to give it away to some pregnant friends I have kept the recipe simple and free from essential oils but if you get a good quality cacao butter then the chocolatey aroma is just perfect by itself. 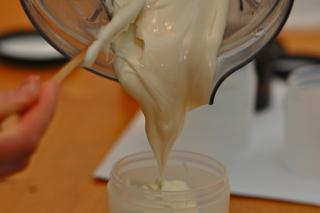 Whipped body butters are popular at the moment with good reason. 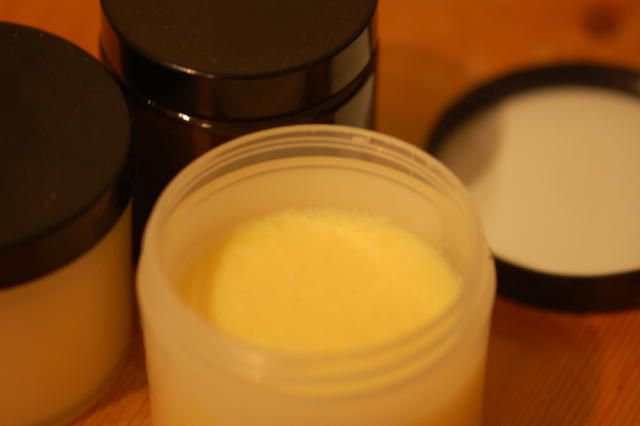 Beating in the air makes them lighter and easier to absorb than a regular balm but without the fuss of adding water to make a cream so the end product is both simple to achieve and lovely to use. During winter I seem to think a lot about food so it’s no surprise that this recipe ended up being nutty, chocolatey and scrumptious smelling. Makes 8 60g jars or 4 120g jars. Half the recipe if just for personal use. Melt all the ingredients except the vitamin E in a bain marie or double boiler making sure the pan underneath doesn’t run out of water. Stir regularly to ensure they are well mixed. Once all the butters are melted, remove the bowl from the heat, allow to cool a little, add the vitamin E and stir well, then place in the fridge for about an hour giving it a stir every now and then. It is good to keep an eye on it as different fridges will have slightly different temperatures so yours may be ready after 40 mins. 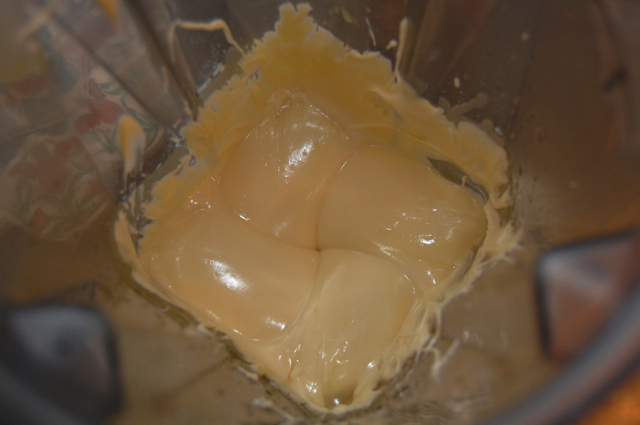 You will know it is good to go as they butters will still be semi-liquid but will have gone completely opaque. If they are too solid you won’t be able to whisk them so do keep checking. 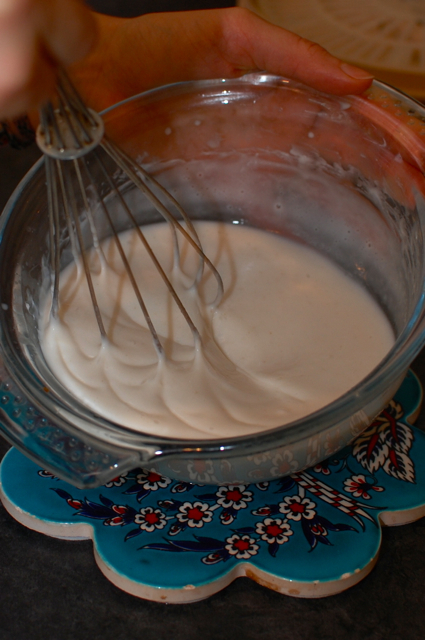 When ready remove from fridge and start whisking. This will be a lot easier if you have an electric whisk, if not be prepared for aching arms! Soon it will start to look like thick buttercream icing. From here you can either spoon it into jars or pipe it in using a small plastic bag with the corner cut off. At last, here is the final instalment in our cream making series, apologies that it’s over a month late! Of the three recipes I have shared this one is the most complicated as it requires precise temperatures and the use of not one, but two emulsifiers. Once you have done it a couple of times though it’s fairly straightforward and it is a reliable cream that I have never had any problems with. This method is taught by Aromantic in their course which I attended a couple of years ago and is very popular amongst herbalists that I have spoken to. Pros are that it makes a light and professional looking cream with a very good finish. Cons are that it involves processed ingredients like emulsifiers and cetyl alcohol and that it does really need a preservative due to the very high water content. The high water to oil ratio could be a pro or a con depending on what you want to achieve. If your key ingredients are water based, for example a strong infusion or floral water, this would be an ideal recipe to follow but if they are oil based, such as infused calendula or St. John’s Wort, then one of the previous recipes would suit your needs better. 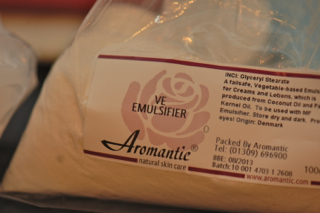 VE and MF emulsifiers are both available from Aromantic, see the link above, and are vegetable derived, usually from coconut or palm oil. Preservative 12 and Preservative Eco are also available here. 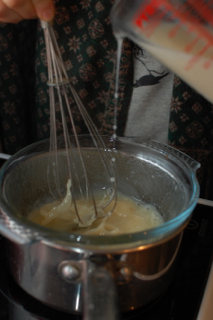 Begin by melting all the fat based ingredients in a bain marie or double boiler. At the same time heat the water/ infusion in a separate pan or double boiler and then add the other water based ingredients, whisking well to ensure the MF powder is completely dissolved in the liquid and no lumps remain. 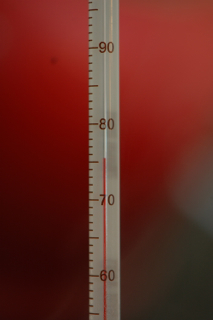 Continue heating until both mixtures have reached between 75 and 80 C.
When both parts are at temperature, turn them off the heat but leave the water part above the bain marie to ensure it remains hot. Pour the oils in a steady stream into the waters whilst whisking gently from side to side. Don’t beat the cream too vigorously or too much air will be introduced. Continue whisking in this way for five minutes to ensure everything is well mixed then remove from above the hot pan to allow for quicker cooling. At this stage I place the container in a pan of cool water to allow it to set quicker and continue gently whisking until it is cooled to below 30 C and nicely thickened. At this point I stir in the essential oils, vitamin E and preservative and spoon into jars. And that my friends is all there is to it. Happy cream making and a very happy Imbolc to all for tomorrow. This is my absolute favourite cream recipe. 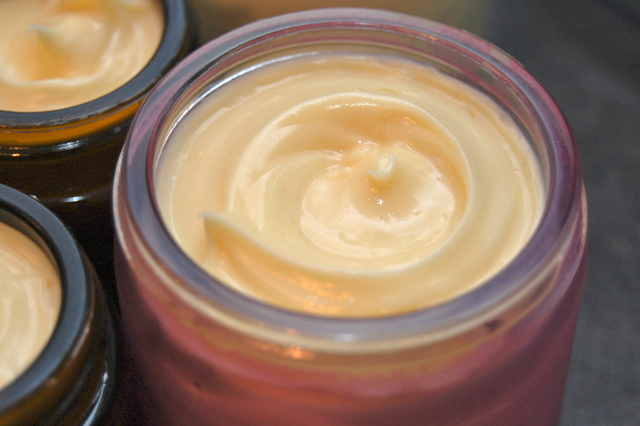 It’s rich, it’s luscious, it leaves my skin silky smooth and it can be adapted in numerous ways. Though it has a higher oil content than creams which use emulsifiers and can therefore feel quite oily when applied, my experience is that it sinks in really well when applied to damp skin and doesn’t leave any residue. In some ways it is the most simple of the recipes and certainly the most natural as it uses no emulsifiers (though the beeswax can help to bind it) and potentially no synthetic preservatives. In other ways it is the most complicated as it requires waters and oils to mix and can take a few tries to get just right, though if you follow these instructions and use good quality ingredients it should turn out well first time. Other pros include the fact that it is almost edible so fits with that old saying, ‘you shouldn’t put anything on your skin that you wouldn’t put in your mouth.’ The high oil content makes it great for dry skins or skin conditions – it’s the recipe I used to make my calendula and chamomile cream which you can see here and also this wonderfully protective and strengthening hand cream here. You only need to use a tiny amount so it lasts for ages and it has a lovely look and feel to it. 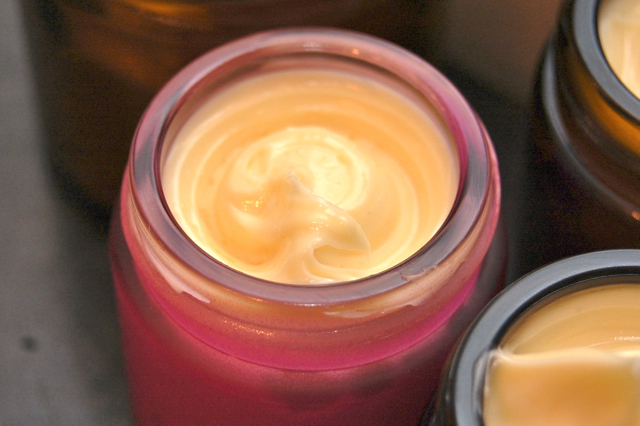 Cons are that it can be more expensive to make than many other creams (which have a high amount of water and only a little infused oil or butters) and it will not last that long if you don’t add a preservative. Also it can be too rich for some people who like very light creams or have oily skins. 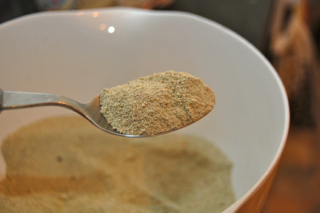 Finally this recipe requires a fairly decent blender, it doesn’t have to be top of the range but if it’s a very cheap one you may find it hard to keep the motor running for long and have to add small amounts of water at a time, turning the blender off in between which can increase the chances of it separating. N.B. Being in Europe I do my measurements in grams rather than ounces. I hope that is not a problem for those in the US, there are online conversion charts or if that is confusing let me know and I will attempt to convert it myself for you. 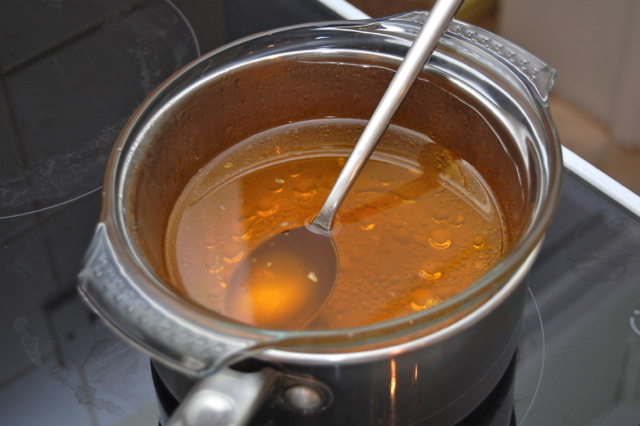 Melt your beeswax and butters in a bain marie or double boiler, then add the liquid oils and allow to become completely liquified, like so. Pour these oils into your blender and allow to cool. Whilst that is happening mix together the waters. You can use just floral water but the glycerine does add an extra silkiness. Aloe vera is great to add for sensitive skins or use herbal tea cooled to room temperature (make it double strength) for additional therapeutic value. 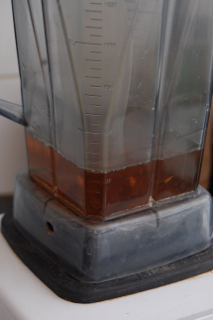 Like in the picture below, it will appear to be setting but when you move the jug you see that it is still liquid though much thicker than when you first poured it in. Don’t let it over solidify, though there may be a small amount on the sides that is set. If so just get a small spatula or wooden chopstick and scrape it down – don’t worry if it looks a bit lumpy at this stage. 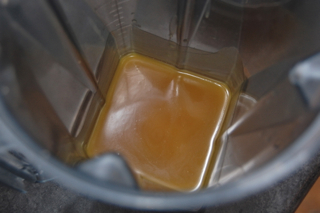 Now turn the blender on to a lowish speed and start to pour the waters in in a slow trickle. 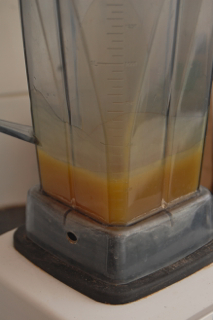 If the blender gets stuck turn it off, scrap the sides down with a spatula and turn it back on again adding a bit more of the water part at a time till the full amount is incorporated. After which the cream should look like this. 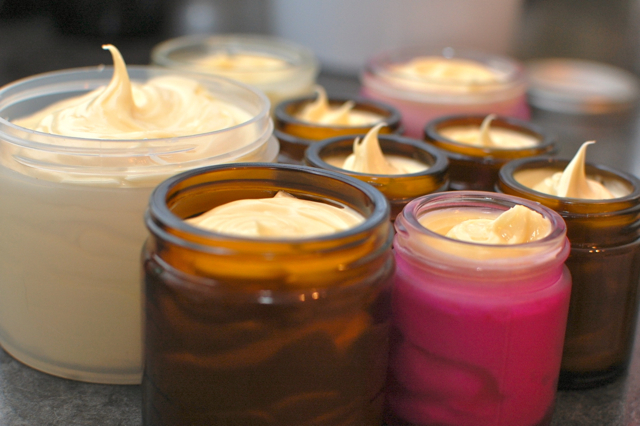 Mix in the vitamin E and essential oils of choice by hand and pour into suitable jars. Thick but just about pourable! Spoon the last bits in then use a chopstick to swirl the top so it looks like the icing on a cupcake. This recipe contains no preservatives but if you would like it to last longer than a month you will need to add one. As it has a higher oil to water ratio compared to most creams it will last much longer however the inclusion of any water in a recipe makes it susceptible to bacteria. If you live in a warmer climate it would be advisable to store it in the fridge. I have never had mine go off and I’ve kept jars for a few months but I live in a cool climate. Also it is good to be aware that creams can be going off before they show visible signs of doing so. You would need to add add a synthetic preservative if you wanted to ensure your creams lasted longer or were planning on selling them. (See part I of this series for more information on preservatives.) I would say if you are just making them for gifts, then keep them lovely and all natural but be sure to use them up quickly. With the weather staying mild so late this year, Christmas has snuck up on me before I am ready for it and I realise now, with just three weeks to go, that it’s time to get into action. 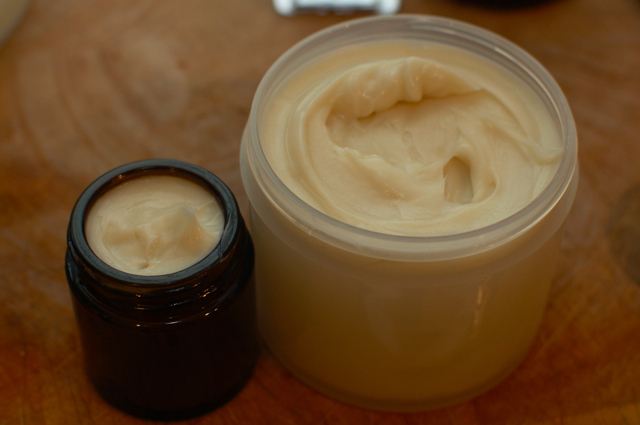 Since beginning this blog, the topic I have been questioned about more than any other is how to make creams. Unlike simple salves and balms cream making can be notoriously tricky as it requires mixing together oils and waters which naturally want to separate. There are a number of ways to achieve a nice cream with a good consistency and, over the next couple of weeks, I’ll be posting the main recipes I have used, hopefully in time for you to make some for your own Christmas presents too. In this post I want to introduce some of the ingredients which can be used in cream making to enable you to adapt the recipes more to your own specifications. There are so many different base oils, herbs, essential oils etc. that its impossible to cover them all here, but I’ll include the main ones I have found useful after much experimentation. If you have any questions or want anything clarifying then do ask in the comments section and I will try to answer if I am able. 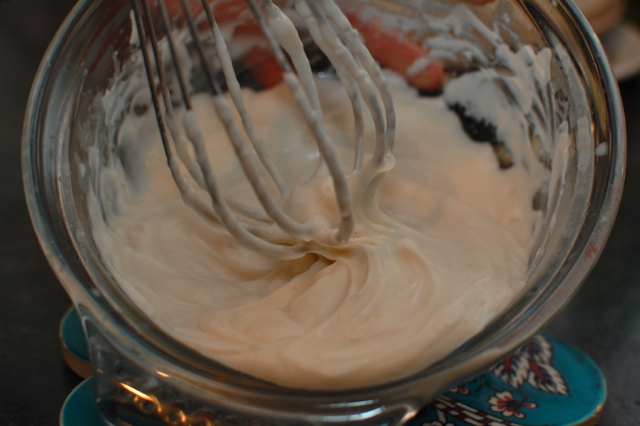 A simple cream involving no emulsifier – my own variation on Rosemary Gladstar’s classic. 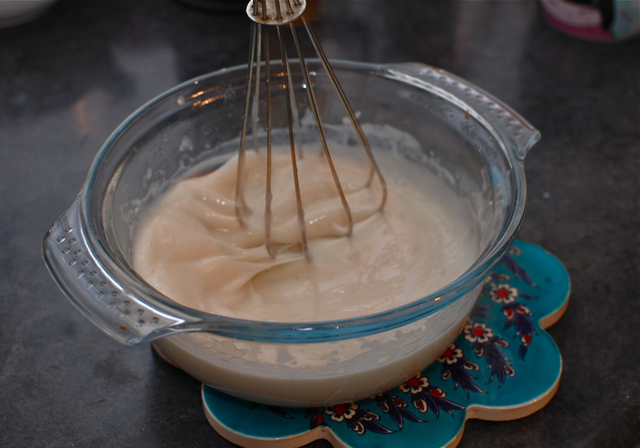 A cream using emulsifying wax – as seems to be most popular in herbal recipe books. A cream with VE and MF emulsifiers – as used by many UK herbalists and popularised by Aromatic in their courses. In my experience, different recipes work better for different people. I’m a firm fan of the first but others I have met prefer to use emulsifying wax. It’s all down to personal preference as some like a richer cream whilst others like something lighter with a higher water content. 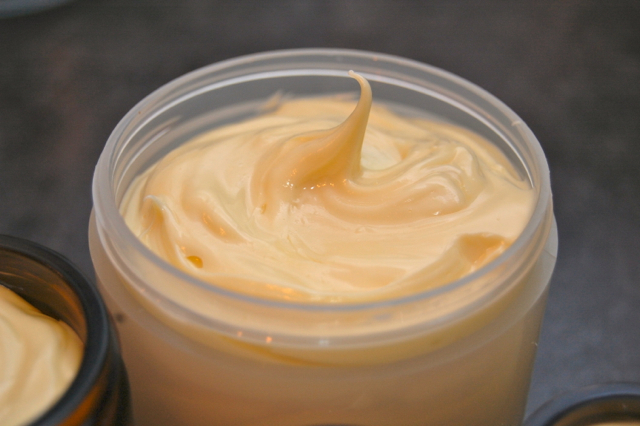 If your cream is for therapeutic use then you need to consider whether the condition you are treating is dry, flaky and in need of protection, in which case a richer cream with a higher oil content is preferable, or whether it is red, itchy, weeping and hot, in which case a lighter cream with a higher water content and cooling, astringent oils will have better results. Base oils and herbal infused oils – Base oils are usually vegetable oils, pressed from nuts, seeds, kernels and other fatty parts of fruits and vegetables. Things to be aware of when choosing base oils include the consistency and smell. Some oils are rich and moisturising and good for drier skins like avocado, hemp, macadamia, argan and rosehip. Often you would only use these in a smaller percentage along with a lighter oil like almond or apricot. Oils like rosehip, hemp and macadamia can have quite a strong aroma, especially if they’re high quality and unrefined so factor this into your recipe and don’t use too much. Lighter oils that are good for oiler skins include hazelnut, grapeseed and jojoba. Sensitive skins respond well to apricot oil. As this topic is something of a vast one, I will dedicate a post to exploring some different base oils in further detail soon. Be aware that some wonderfully nutritious skin oils like borage and evening primrose have a very short shelf life, around 6 months, so ensure you get them from a good supplier and store them in the fridge. Never buy oils that smell rancid and be aware of using nut oils on those with allergies. 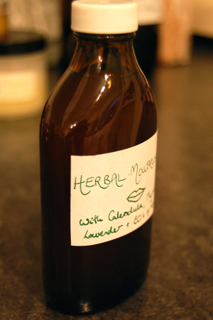 Herbal infused oils are simply vegetable oils infused with herbs. You can read my post on how to make them here. 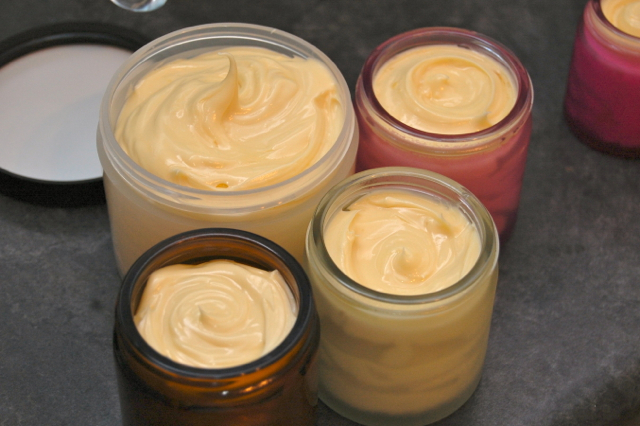 Solid oils and butters – These include cacao butter, coconut oil, avocado butter, mango butter and shea butter and they are rich and moisturising as well as adding body to a cream. 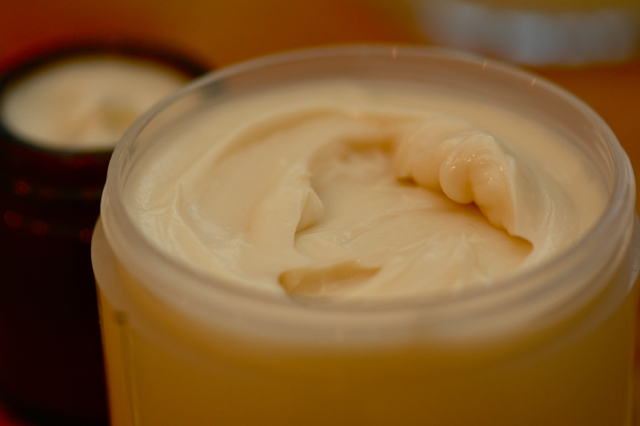 For a lighter effect which sinks in to the skin easily use coconut, or for a rich, nourishing hand cream opt for shea. Cacao is nice in both body and face creams and, if you get it food grade, it lends a delicious chocolatey aroma to your finished product. Somewhere between a liquid oil and beeswax or plant waxes in consistency, fats will partly absorb into the skin but will leave something of a protective film behind. 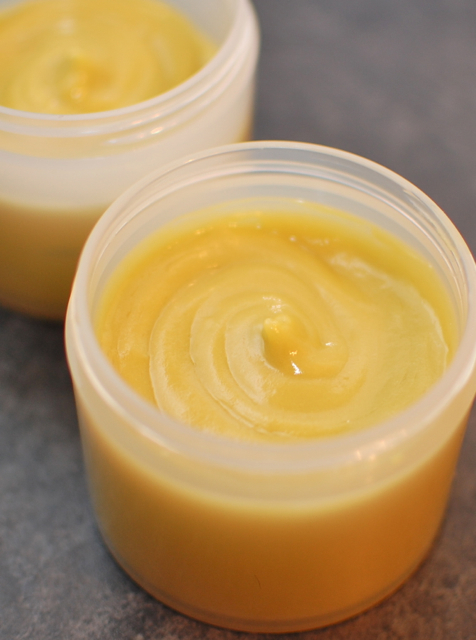 Beeswax and plant waxes – These thicken and add body to creams and also help a little with emulsification. They are not well absorbed into the skin creating a protective barrier that helps it maintain its own moisture and keeps it hydrated, especially during these wintery months with their high winds. Waters – These include spring water, floral waters, herbal teas and aloe vera. You can vary them endlessly to suit your purpose. If you are making a plain base cream try using just spring water or if it’s a luxury face cream then use rose floral water. If you want a soothing cream with anti-inflammatory properties then try a strong tea of chamomile and calendula. Vegetable Glycerine – Glycerine is a sweet, syrupy, clear liquid that helps draw moisture to the surface of the skin. In very dry climates it can apparently take the moisture from deeper layers of skin so best to avoid using it, but if you live in the damp UK, it can be a nice addition and improve the consistency of your creams. Tinctures – A small proportion of a suitable herbal tincture will add therapeutic value as well as helping to preserve your cream. 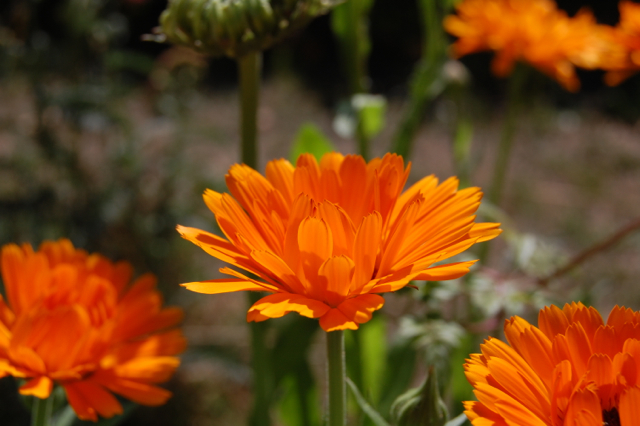 Try calendula in a soothing cream, comfrey in a bruise healing cream or yarrow in an anti-inflammatory cream. Do beware though that alcohol can irritate sensitive skins. Essential Oils – The volatile oil content of the plant is distilled, pressed or extracted with solvents leaving a highly concentrated and powerfully aromatic liquid that can be used for strong therapeutic benefits or simply to make the product smell delicious. 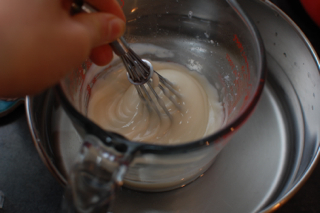 Emulsifiers – These help the water and oil parts of a cream to mix and leave a homogenous finish. Common ones include emulsifying wax, vegetal and VE/MF emulsifiers all derived from vegetable sources, albeit after some intense processing! Another commonly used and readily available emulsifier is borax, though I have heard mixed reports of its safety and prefer not to use it myself. Vitamins and minerals – These can be added to creams and usually come as a powder or in liquid form. Vitamins A, C and E are the ones most commonly used as they are good anti-oxidants and can help prevent oils going rancid. Sometimes minerals like zinc are added to sun creams to create a barrier against the suns rays. Natural preservatives – These include rosemary extract and grapeseed extract. Both are powerful anti-oxidants that can increase the shelf life of creams. They have some anti-bacterial action but most agree it is not powerful enough for products sold commercially. Grapefruit seed extract is more powerfully anti-microbial but there is much evidence out there that suggests it is harmful so I suggest reading the research yourself before using it. 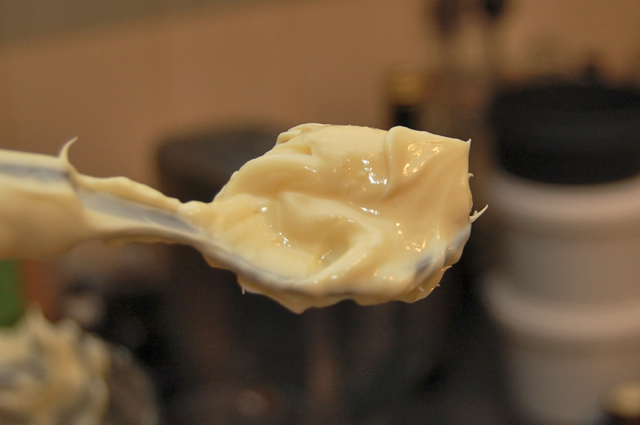 Synthetic preservatives – Creams are much like food. 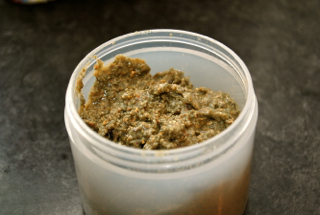 If you plan to use them quickly (how quickly will depend on the recipe) and keep them cool then you have no need to go down this route but if you are planning to keep them for longer than a few weeks or if you wish to sell them you will need to add a synthetic preservative which will protect against moulds, yeasts, bacteria etc. Though there is conflicting evidence as to whether all types of parabens are carcinogenic, I personally avoid them altogether. Some of the safest ones seem to be Preservative 12 and Preservative Eco, both sold by Aromantic. I often avoid using these where possible but for creams with a high water content they are always necessary. I will post the first recipe in the next couple of days so check back soon.